The Ravens trampled the NFL's 31st-ranked rushing defense, piling up 242 yards on the ground Sunday in a 34-17 victory that only magnified the Raiders' defensive shortcomings. BALTIMORE (AP) — It wouldn’t be an understatement to say the Oakland Raiders got run out of Baltimore. The Ravens trampled the NFL’s 31st-ranked rushing defense, piling up 242 yards on the ground Sunday in a 34-17 victory that only magnified the Raiders’ defensive shortcomings. It didn’t matter that Baltimore was starting a rookie quarterback in Lamar Jackson, or had a backfield that included undrafted rookie free agent Gus Edwards. Jackson’s ability to use his feet kept Oakland guessing and Edwards rushed for 118 yards, his second 100-yard game in as many weeks. The Raiders (2-9) were right there with the Ravens until the third quarter. Baltimore took the kickoff and ground out a 13-play drive that featured 12 runs, lasted nearly seven minutes and ended with a 5-yard touchdown run by Jackson for a 20-10 lead. Oakland answered with a touchdown, but had no response to Baltimore’s next run-heavy march — a 17-play marathon that lasted 8 minutes, 53 seconds and stretched into the fourth quarter. The Raiders knew Jackson was going to run. The 2016 Heisman Trophy winner at Louisville can throw the ball well enough, but his strength is in his legs. The Raiders did get two interceptions, one apiece by Marcus Gilchrist and Reggie Nelson , but Jackson threw for 178 yards and a score in his second NFL start. When on offense, the Raiders turned to quarterback Derek Carr to keep pace with Baltimore’s relentless attack. Unfortunately, the offense line couldn’t give him ample space and time to find receivers. Carr was 16 of 34 for 194 yards and a touchdown, but was sacked on three consecutive fourth-quarter plays by Matthew Judon, the first resulting in Terrell Suggs’ 43-yard fumble return for a TD. 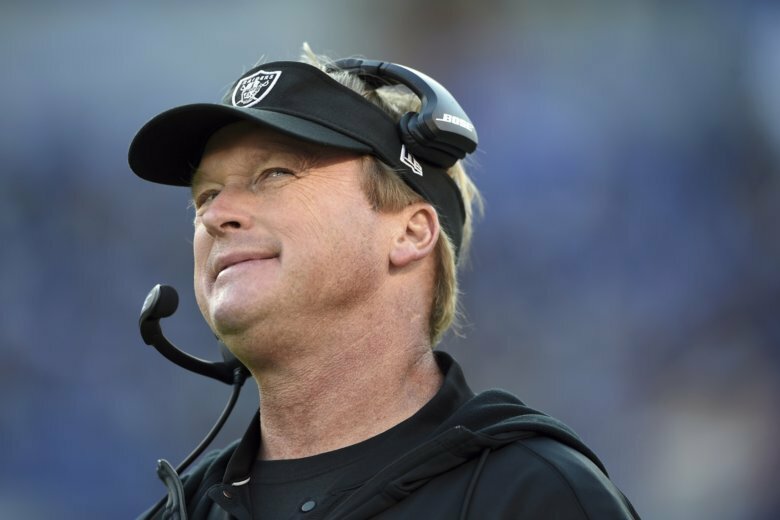 “I don’t ever remember that happening before,” Carr said of the sack-sack-sack sequence. Carr hobbled off the field with a tender ankle, the results of the beating he took from the league’s top-ranked defense. But he vowed to return next Sunday for a grudge match against the Kansas City Chiefs.